MSCF’s highly-integrated, interdisciplinary curriculum is well-balanced between theory and practice. Programs “owned” by business schools can be strong on financial markets but pay less attention to the mathematical modeling. Conversely, programs “owned” by math departments are often highly theoretical and less focused on “real world” applicability. The MSCF curriculum is constantly changing to meet the needs of the financial markets. While stochastic calculus and computational techniques such as Monte Carlo simulation, optimization, and the numerical solution of partial differential equations prepare students to create and validate the mathematical models underlying much of the finance industry, our statistics and programing courses prepare students for careers in data-driven algorithmic trading, risk management and quantitative portfolio management. For those interested in a data science career in finance, the MSCF degree may better prepare you than either a MS in Data Science which covers a broad range of applications or an MS in Business Analytics which seek to improve a firm's performance using data-driven decision making. 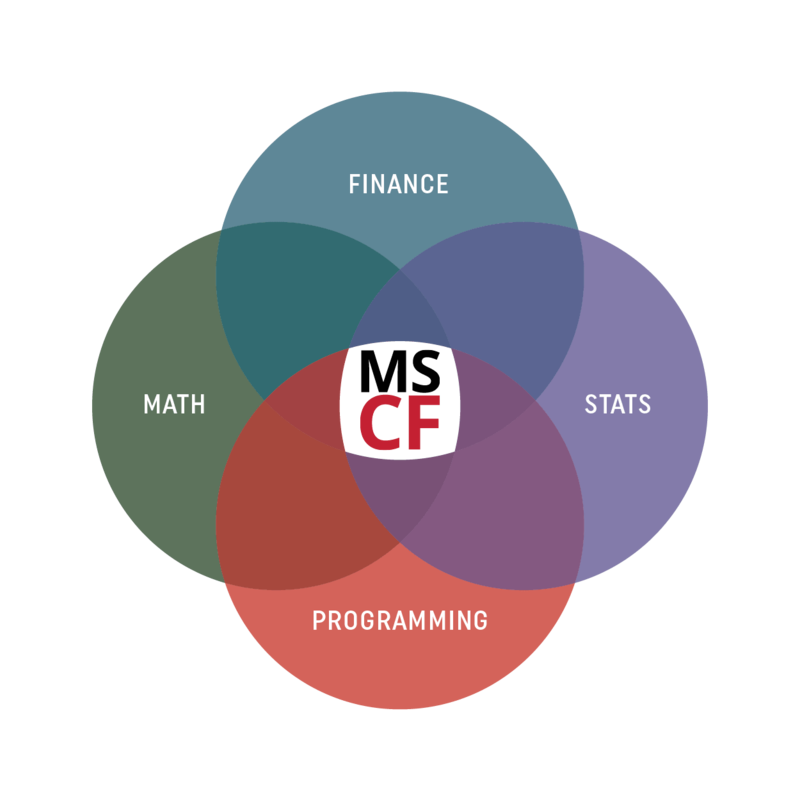 Neither of these kinds of programs has the laser focus of MSCF, applying machine learning and other data science tools to quantitative finance. Taught with mathematical rigor coupled with the necessary computational skills provided by our computer science courses, students emerge from our program exceptionally well prepared for data scientist careers in the finance industry. The MSCF course of study is a blend of traditional lectures, individual and group projects, and presentations. All MSCF courses are developed expressly for the intended career paths our students, with introductory courses in the early fall leading to core courses throughout the first year followed by additional core courses and various electives in the final semester, allowing you to focus on the area of quantitative finance of most interest to you. In the beginning of August, four weeks before the start of the degree program, the “MSCF Prep” session provides preparatory classes in math, probability and financial markets. In addition, working with your career counselors, you will learn about the various quantitative finance career paths, build your resume and learn networking and interviewing skills from MSCF’s full-time communications coach and our alumni. A required, online Python course is offered in July as well as an optional series of online lectures on financial accounting and shadow banking. Over the Fall and Spring of your first year, you will learn traditional finance theories of equity and bond portfolio management, the stochastic calculus models on which derivative trading is based, Monte Carlo simulation methods for computing prices and risk measures, statistical methodologies including regression and time series, and financial data science. C++ and Python are woven throughout the curriculum to provide you with the software skills you will need throughout your career. A presentations course will help you communicate your ideas to your peers. The Deutsche Bank Trading Competition, offered on the Interactive Brokers Traders Workstation’s simulated trading platform, provides real-world trading experience. The Financial Engineering course requires you to work on a team to solve a problem and sell your solution. Throughout, courses offered by the Communication Development Program will build your confidence as you learn deportment, networking and effective writing — in short, how to function on Wall Street. You will learn about the inner workings of the financial markets through your summer internship, returning to the program in the fall with a much better sense of the full-time position you wish to pursue. Recruiter interest in our students is strong and our career counselors will work closely with you to assist you in the internship search. Over the last five years, 98% of our students have obtained internships. Of those, 89% have been in the United States. For the final semester, following your summer internship, you will take a mixture of required and elective courses. The elective courses permit you to specialize in quantitative research, financial computing, asset management, algorithmic trading, and risk management. A four-course data science sequence covers a comprehensive range of topics from data science, machine learning and statistics, all tailored to the challenges of dealing with financial data. Sophisticated methods of data visualization, mining, and modeling can extract useful information from the flood of complex, noisy, big data that arises from financial markets. Our first two courses cover modern tools from data science that enable this transformation, i.e., turning financial data into features. The second two courses in the sequence describe statistical and machine learning methods for learning relationships between these features, and using these relationships to predict future behavior. Throughout, there is a strong emphasis on computing tools useful for implementing the described tools. The MSCF program reserves the right to change course times and offerings. Students will be notified of any changes via email.